This Franciscan sanctuary set against the Aizkorri mountain range carries both spiritual and historical significance for many pilgrims to the site. Tradition states that Virgin appeared in a hawthorn bush, prompting witnesses to ask "Arantzan zu?" (Is it you in the hawthorn? ), giving the place its name and bringing thousands of years of pilgrims and art devoted to it. The area has suffered multiple fires and seen many restorations since then, most recently in the 1950s with a beautiful monastery that stands picturesquely on the edge of the mountain. It sits at the base of the road leading to the highest mountain in the Basque Country, surrounded by the valley’s trees and ravines, and has since become a symbol for avant-garde architecture. Sculptor Jorge Oteiza created the 14 apostles on the façade, while the iron gates were designed by Eduardo Chillida and paintings by Nestor Basterretxea and Lucio Muñoz. The Sanctuary is located nine kilometers away from the center of Oñati. It is within the Aizkorri-Aratz Natural Park, which makes it a convenient base for many of the hiking trails there. 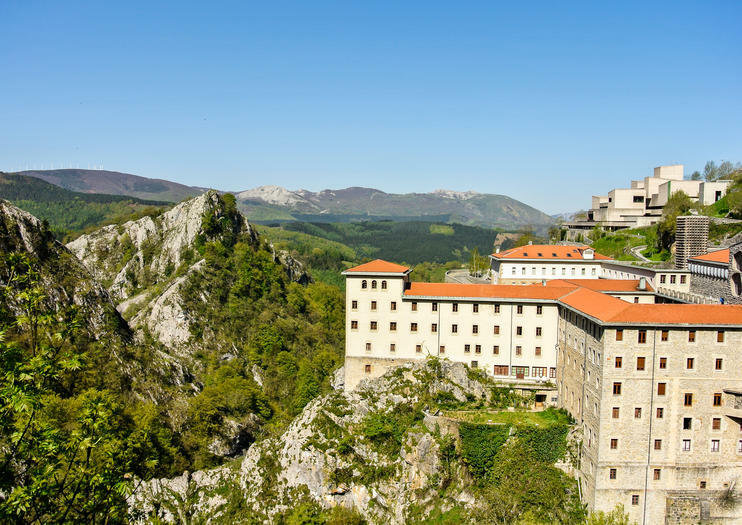 Combine several Christian sites in one itinerary with this full-day tour in the Basque Country. Learn about religion and architecture from a local guide while you explore the hilltop San Telmo hermitage, the Sanctuary of Loyola, and the Sanctuary of Aranzazu. Relax between stops over lunch with wine. Convenient hotel pick-up and drop-off are included. Discover the secluded secrets of the Basque Country on an explorative excursion from Bilbao. Uncover rural villages, picturesque palaces and historical monument with an accomplished guide, visiting significant landmarks like the Sanctuary of Arantazazu and the Basque Country’s oldest university. Admire luscious landscapes and enjoy convenient round-trip transportation from your hotel on this enriching adventure.